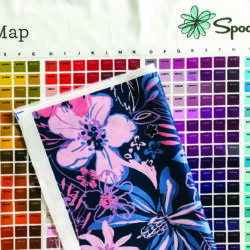 Welcome to the third installment of The Spoonflower Seller Handbook! Are you ready to kick your branding up a notch? If so, keeping reading. If not, still keep reading… I now feel challenged to convince you. You may be asking – “Isn’t it already a lot to simply focus on designing? Does this one extra thing really even matter?” Yes, it does! Your Spoonflower shop is the storefront, your username is the name of the company, and the look and feel of it all is your brand. And you’ve got hundreds of other businesses trying to compete for the same customer. 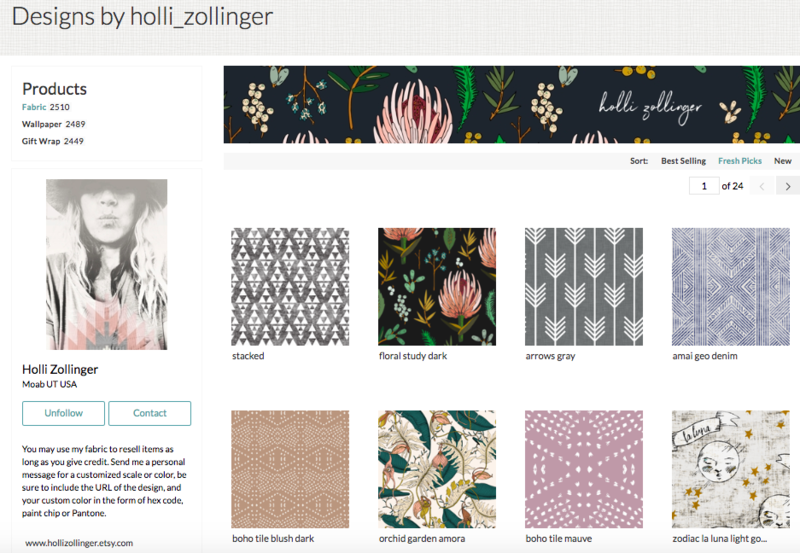 That means that as a Spoonflower seller, you need all the same things any business has to help support the brand – a visual identity, a color palette, a logo, a point of view, even a mood. And because it’s 2019 and we live in a digital world, your “brand” even extends beyond just your Spoonflower shop, to your social channels and website. 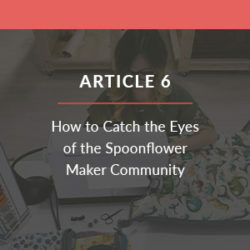 Taking the time to think through and cultivate your brand will make you more memorable, and will set you apart from all those other “businesses” in the Spoonflower marketplace that a shopper might also be considering when deciding what to purchase. I know it can seem like a LOT at first, but don’t worry, we’ll go through each of the most important elements of brand building one by one, together. And after that, if you need that little push of inspiration, check out our exclusive interview with Nadia Hassan of Modmagpie. 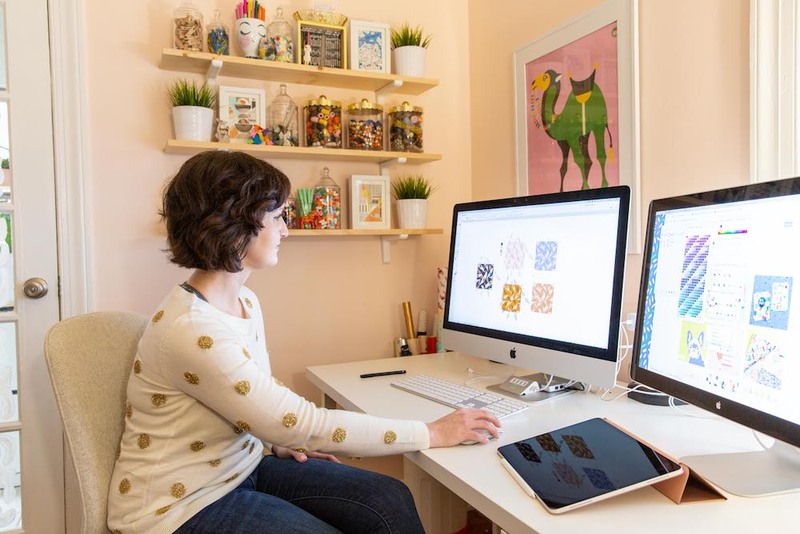 Nadia is an experienced freelance surface designer and Spoonflower seller who knows a thing or two about how to nail this whole branding thing! So where to start? A good exercise to go through as you begin building out your brand is to ask yourself the questions below, and really spend some time thinking each one through. Once you’ve had time to contemplate each question, write down your answers in a notebook or a place where you can keep track of them over time. 1. How do I want people to feel when they look at my shop? It’s best to approach this question by creating a word cloud associated with your body of work (AKA all of the designs in your shop). When you look back at your designs, what adjectives come to mind straight away? Does your shop have a personality? 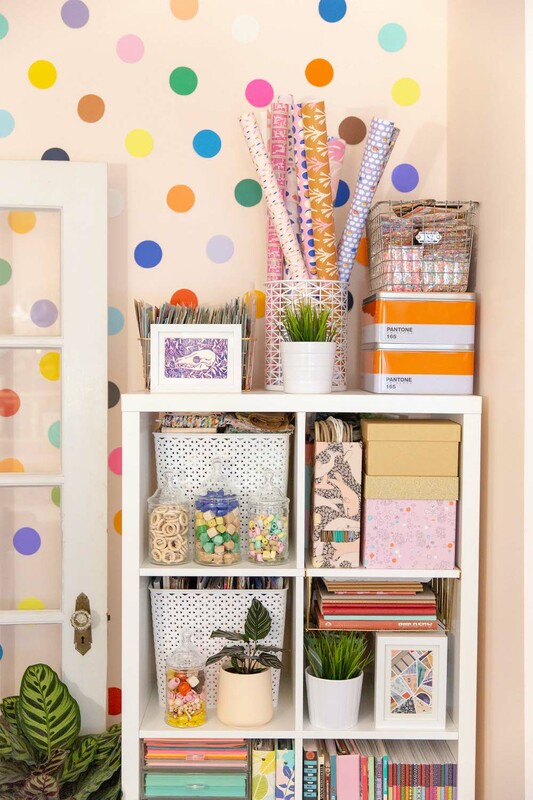 It could be anything from moody, to funky, to quirky, happy, energized, calm, playful… you get the idea! Just be honest and write down the first words that come to mind without overthinking it. The way your designs can be described may also capture how you want people to feel when they view your shop. 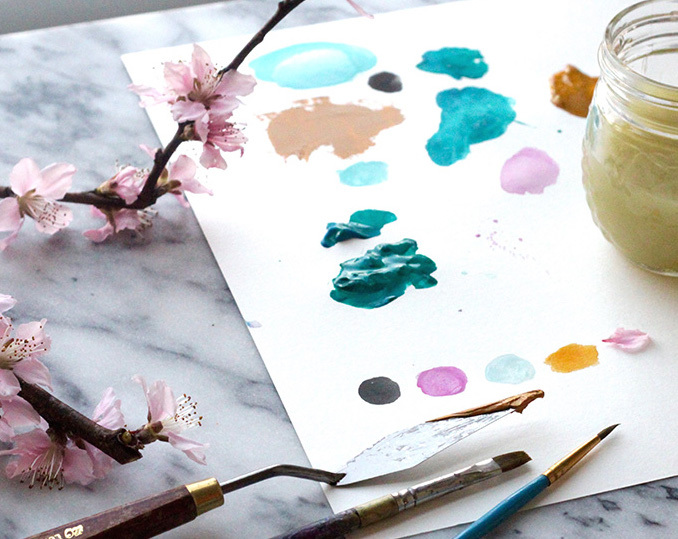 For example, are your designs pastel, neutral, and all made with water-based media? Then you may wish to evoke a sense of calm or tranquility in everyone who stops by your shop. By identifying this emotion or intention for your brand, you can let that inform your story, which then carries through to everything from the tone of the messaging in your posts on Instagram, to the collections you curate in your shop. Nailing down these key emotions, adjectives, and words to describe your brand’s personality will go a long way in helping you to focus the rest of your narrative and tell a cohesive story that will be sure to stick in shoppers’ minds. 2. 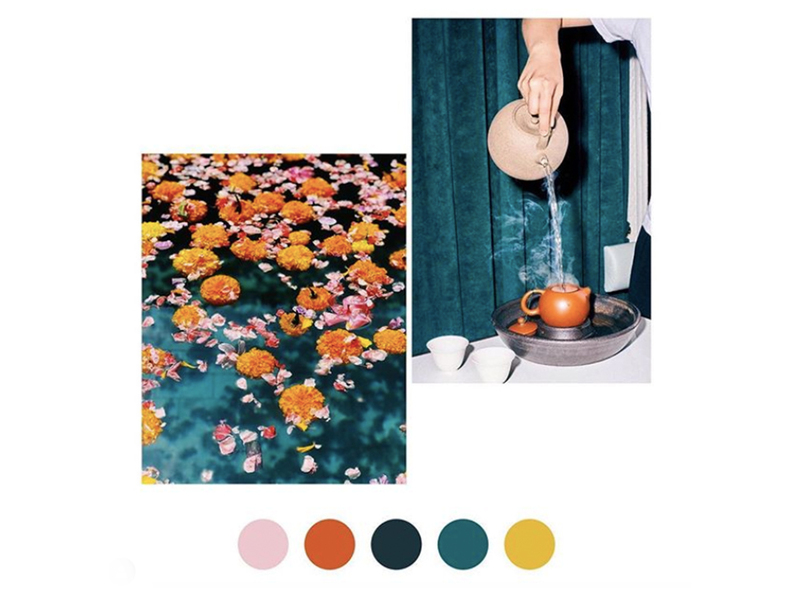 What is my brand’s color palette? Look back at all of your designs. 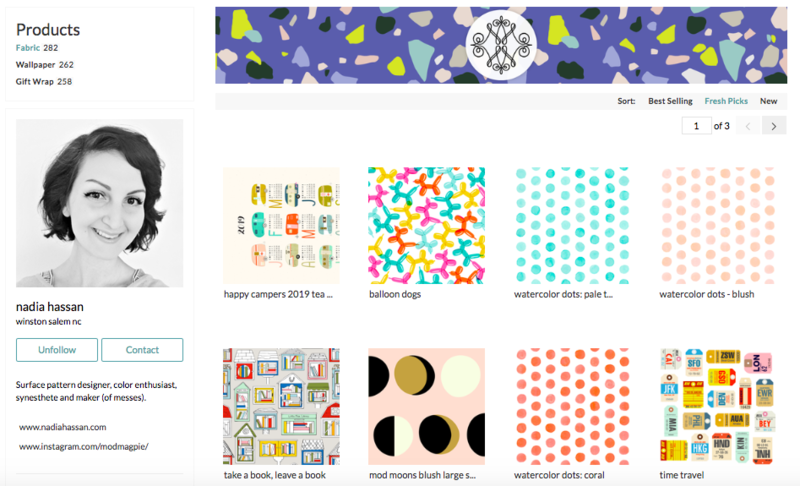 Whether you have a full shop on Spoonflower, an Instagram of all your designs, or just a sketchbook full of doodles to go off of, find your portfolio of aggregated work, stand back and analyze it as a whole. What colors stand out to you? Maybe you use a multitude of hues, but are there four or five that are repeated more than the others? This is your brand palette. Establishing what these colors are now will provide a reference guide for all of the assets that you may wish to create going forward, from your shop banner and logo, all the way down to your Instagram posts and business cards. 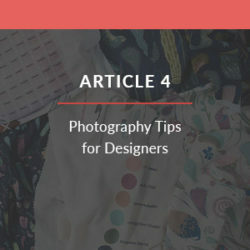 Developing these clear aesthetic guidelines and establishing a consistent palette will help you connect with potential shoppers and illustrate the personality and values of your shop. Now your brand is really starting to take shape! 3. What kinds of projects do I envision makers creating with my designs? Would your designs be perfect for baby clothes because they’re small scale, whimsical ditsy prints? Or are they large scale and neutral with lots of interesting textures, thus better suited to home decor? Perhaps you always picture your designs on dresses while you’re carefully crafting each repeat. It’s important to brainstorm the projects your designs are best suited for, and thus the person who is most likely to purchase from your shop. Keep this person in mind as you design surface patterns and market them. What other brands do they shop from? Do they have a shop of their own selling handmade goods? What stage are they in their life? Perhaps they’re redecorating their home or maybe setting up a nursery. Knowing who your customer is will help you create a message and identity that resonates with their values, interests, and needs. Focus on them — don’t worry about being everything to everybody. Maybe you don’t know who this person is yet, and that’s okay too. Next time a customer messages you on Spoonflower to ask for a scale change or color update, you might consider asking what they plan to make with your design. Over time you may notice a trend — people seem to always use your designs for tote bags, or you keep getting repeat wallpaper purchases. Keep your ears perked and your eyes peeled, search Instagram for hashtagged makes featuring your designs (ask customers to use your hashtag or tag you! ), and never be afraid to engage with customers directly to find out more. 4. Does my storefront and profile image match the look and feel of my designs? Consistency and cohesion is absolutely essential to creating a brand that makes sense and makes a lasting impact. If your designs and the look of your shop are all over the place, shoppers won’t get a clear understanding of who you are and what you represent. So while you may be tempted to create “a little something for everyone” – in service of your brand in the long run, it’s best to identify who you are and what your aesthetic is, then stick to that with every element of your shop. Make sure your social media presence and visual brand identity, from business cards to stickers and beyond, reflect this same visual consistency and tone as well. 5. Is my Spoonflower username the same as my Instagram handle? 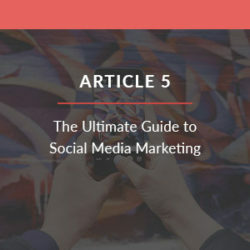 This may seem simple, but it’s really important when considering how easy it is for shoppers to find you on social media – especially if you don’t have your Instagram handle (or other social channels) linked directly in your shop. 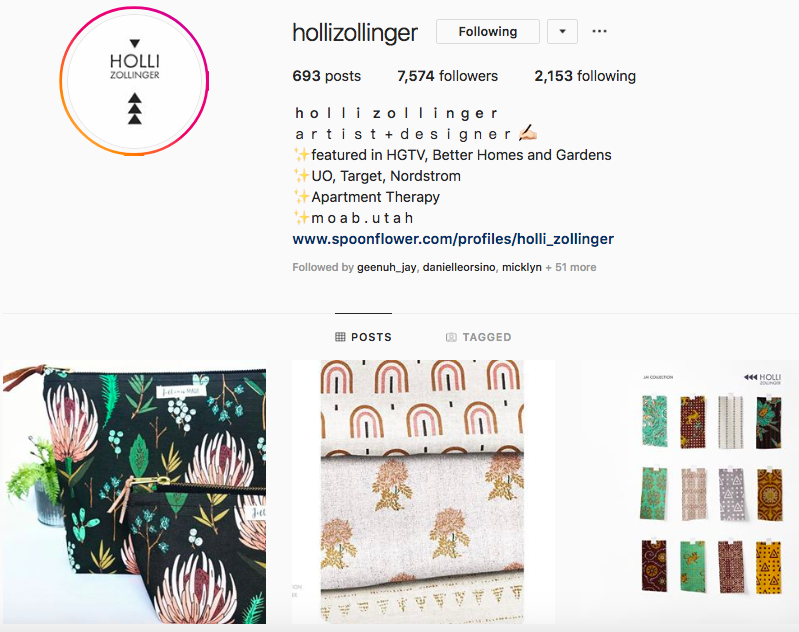 Designers who make it easy for shoppers to engage with them off of Spoonflower via social media, email, or otherwise increase the chances of repeat customers because you’re building connections and relationships that keep your designs top of mind for your target customers. They found your design and made their way to your shop – your branding is what will keep them coming back again and again! 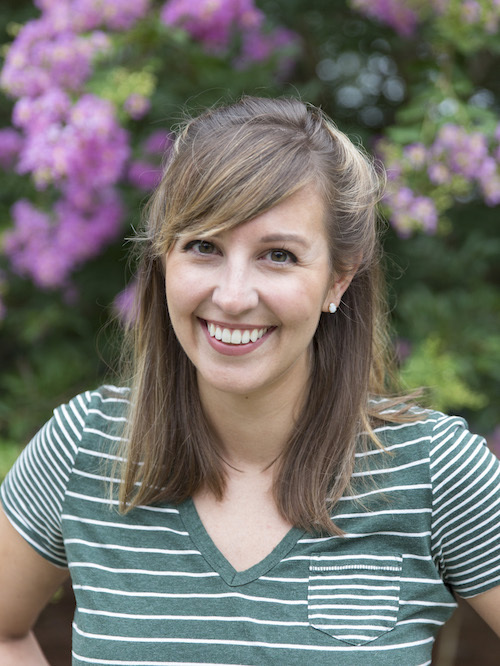 A Spoonie since 2012, Theresa manages social media here at Spoonflower HQ in Durham, NC. 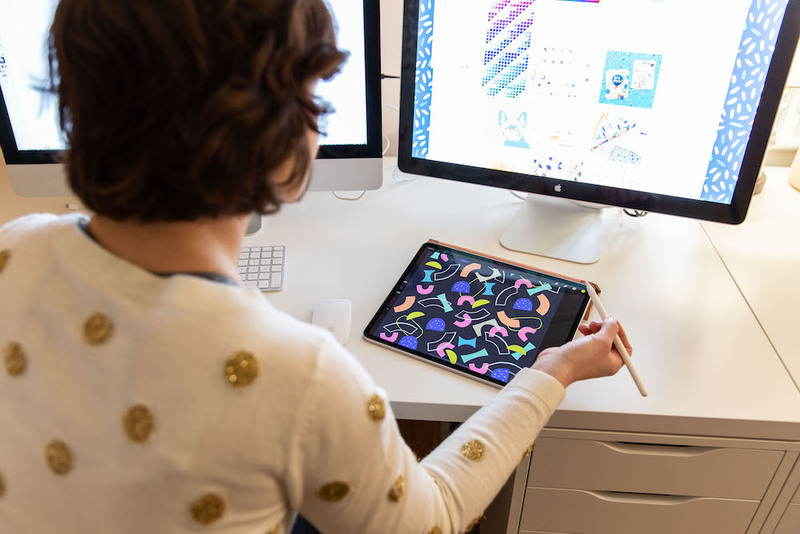 Because she just can’t get enough surface design, Theresa keeps busy on the weekends making patterns for her Spoonflower shop, and doodling watercolor illustrations (probably of fast food). When she’s not buried deep in the world of surface patterns, you can also find her sewing up handmade apparel from one of her fave indie pattern designers, making big floury messes in her kitchen, or teaching herself Britney Spears songs on the ukulele. As a graphic designer I have done many branding projects for other business, but I can’t seem to do it for myself. Always the cobbler with out the shoes story I guess. This has inspired me to work on my visuals and branding. This article has really made me think! 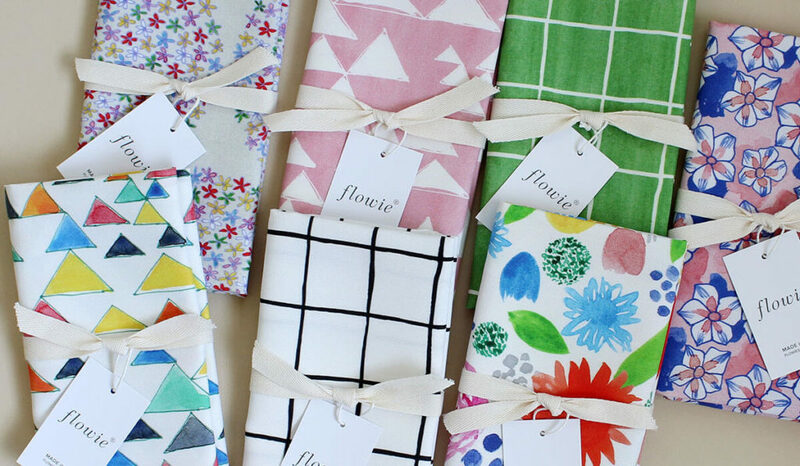 I have a branded business called Louise Isobel Designs but I have kept my Spoonflower shop separate from this as I wanted an outlet for designs which don’t fit with the brand. I have a Louise Isobel Designs collection within the shop which I link to on my website.